Natara Bonsai has long been my favourite outliner, but in the last couple of years it has been gradually displaced in my daily use by WorkFlowy, mainly because WorkFlowy syncs automatically and seamlessly across all my devices using different platforms, which is very useful for capturing notes and todos and having them always available. Nevertheless, there are situations where Natara Bonsai is still my go-to choice. For example, when I need to organise, analyse, sort and resort large lists, or when I need to hierarchically structure some complex information, where it helps that different hierarchical levels can be displayed in different colour, to guide the eye. Fortunately it is very easy to get information from Natara Bonsai back into WorkFlowy. All you need to do is install the OPML export template from the CarbonFin website (instructions available there), then export the Bonsai outline as a .opml file, open the .opml file using your favourite text editor (for this task I like to use Notepad++), and simply copy and paste the contents of the .opml file directly into a WorkFlowy bullet point. WorkFlowy will not only preserve the outline hierarchy but it will also display any Bonsai outline item notes as inline WorkFlowy notes. Frank Degenaar points out in the comments section that it is possible to add colour to a WorkFlowy outline as well, using the “Painter for WorkFlowy” Chrome add-on and some stylesheets using the “Stylish” add-on. That is definitely true and I do make use of those tools in my WorkFlowy all the time. It would only take me a minute or two to reconstruct the colour scheme of the above Bonsai outline in WorkFlowy, and the two would look fairly similar (especially if I change the dark WorkFlowy theme to a light one). However, the colouring-in capability of Natara Bonsai works quite differently from that of WorkFlowy and serves a different purpose. You can set up Bonsai so that it automatically colours in your outline items according to the outline level position they occupy. This means that if you promote or demote an outline item, its colour will change accordingly and automatically. While it is possible to retrospectively colour in a WorkFlowy outline by adding a colour tag to each item individually and manually (which would be time-consuming in the case of very large and multi-level outlines), these colours will not change when you demote or promote these items, as their colour tags will travel with them. The key point here is that when using Bonsai, the colour scheme has already been set up as default (using the procedure I described earlier), so I don’t have to pay any attention to the colouring-in, it just works automatically as I type away and keep promoting and demoting items. In contrast, with WorkFlowy the colouring-in needs to be done manually, individually for each item, and retrospectively, after the item has been added, and it does not change, if I move the outline items, thus breaking the logic of the “colour by hierarchy level” scheme. This difference becomes significant when you want to work on large and complex lists and you want to pay attention to the text, rather than be disrupted by the mechanics of colouring-in. Bonsai just allows you to work faster, without having to make decisions about and fiddle with every single item, as you would have to in WorkFlowy. By the way, as I have already explained in that earlier post, it is possible to use other criteria for the automatic colouring in Bonsai, such as category, priority or due date. I still get visitors coming to this site looking for the outliner Natara Bonsai almost daily, as I mentioned it occasionally that it was one of my alltime favourite pieces of software. Unfortunately the Natara Bonsai download page went down sometime in 2014, never to come back again. There is now only a placeholder page for the main Natara site that points to the Natara blog (the last post on which dates 6 June 2013). A few months after the Bonsai site has disappeared, I stumbled upon some kind of a mirror site at http://64.226.29.51/Bonsai/Download.cfm where it was still possible to download the software from. I was very happy to share that link, and I got a few emails from Bonsai fans thanking me for it. Apparently Bryan Nystrom, the owner of Natara Software, Inc., was kind enough to sell them a licence. I cannot vouch for the safety of these files, so download and run them at your own risk. But chances are they might just be the original Natara Bonsai files. So fellow Bonsai fans, rejoice! My blog stats tell me that there is a steady stream of visitors looking for Natara Bonsai, ever since the main download site has disappeared a few months ago. It seems that there is still at least one site where Bonsai 5 Desktop Edition can be downloaded from (and there may very well be some others out there). I don’t know whether this site is legitimate, so download anything at your own risk, and make sure you scan the file for viruses. However, I know of at least one reader who has done so, and he sounded happy. Here is the link: http://64.226.29.51/Bonsai/Download.cfm. It seems to be some sort of a mirror of the original site, as it looks identical. If you do not have a license, you could try to contact the administrator of the Natara blog to find out if it is still possible to purchase one. Natara Bonsai is one of my old time favourites. While there are some other capable outliners out there, when I need to analyse textual data in long and complex lists, none are as easy and fast to use as Bonsai. The last version I have is v. 5.0.3 Build 3233. I run it on a Win 7, 64-bit machine, and it works perfectly. For some time now I’ve been using Freeplane as my reading-note capturing application. 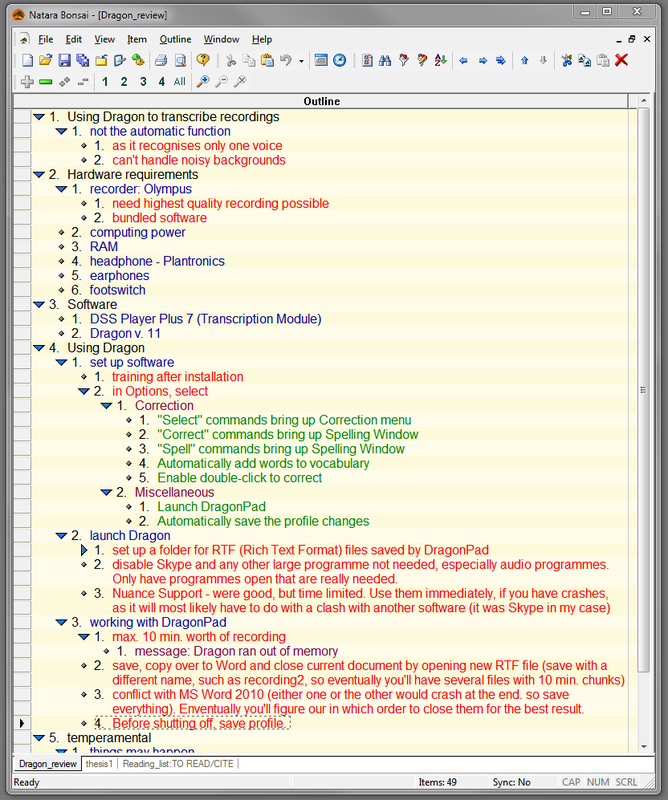 I would be reading a book at my desk, in front of my computer monitor(s), and use Dragon NaturallySpeaking to dictate my notes and quotes into DragonPad first, and then paste them into Freeplane. In the case of electronic materials, mainly journal articles in PDFs, I would convert the PDF into a Word file with ABBYY FineReader (so that I preserve word-wrapping and formatting while copying), and then would paste the quotes into Freeplane. What are the advantages of this method? Firstly, it allows me to reverse-outline the book’s argument by organising the quotes and notes into a hierarchical mind map. Such a reverse outline helps with reconstructing and understanding the main train of thought of the reading, as the hierarchy records logical relationships between ideas. Here the mind map format has an advantage over a traditional vertical outline, as the individual nodes are easier to see and comprehend when distributed across a wide monitor in landscape form. Secondly, each node can have a title and a note, and the latter can be seen inline (as opposed to being separated into another pane, as in most dual-pane outliners). Also, Freeplane can preserve rich text formatting (unlike let’s say Natara Bonsai). You can use icons and different styles to mark important notes. It is easy to restructure the outline by dragging and dropping nodes and branches around. Thirdly, it is easy to convert a Freeplane mind map (which uses Freemind’s .mm file format) to other file formats. I use iThoughtsHD on iPad as my Swiss-Army Knife converter of mind map formats. I usually convert it into OPML, in order to import it into Bonsai, if further organising and analysis is needed, or simply to convert it into RTF, so that it can be imported into my main database, ConnectedText, which is the final destination of all my notes. I also link to all the different formats of a file (.mm, .opml, .otl, .rtf) from the final CT document, so I can easily find them later. But Freeplane is useful not only for capturing and organising my reading notes into a hierarchical outline. It also comes in handy when it’s time to write up the notes for a chapter or article. I start a new Freeplane file as my outline for the new piece of writing, and I can simply copy and paste selected nodes and entire branches of quotes and notes from other Freeplane files, thus gathering relevant information for one author from let’s say five other mind maps with notes for five books by that author. 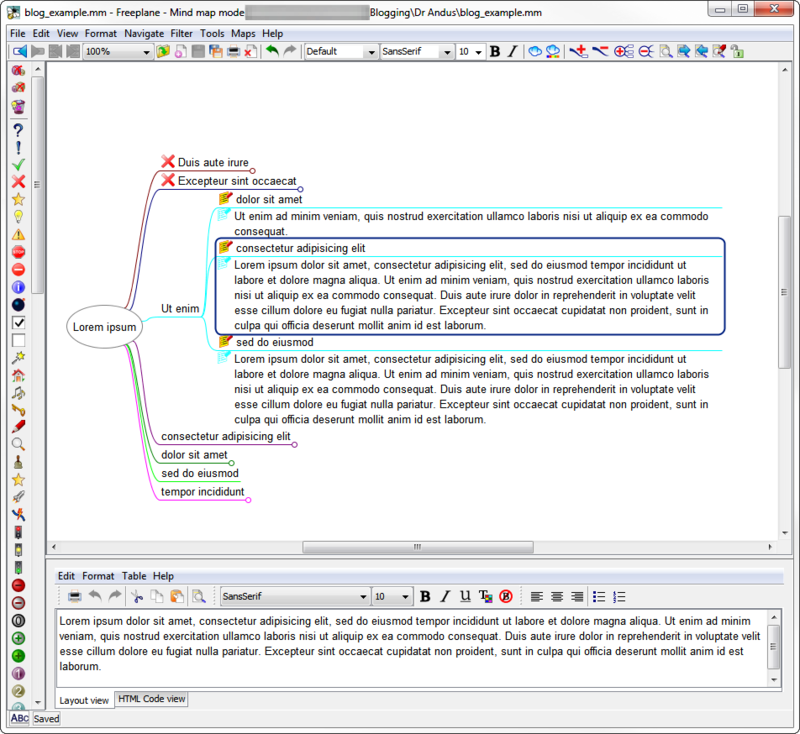 (It is useful though to have two monitors for this, to take full advantage of the landscape orientation of mind maps.) Then as I write the final piece, I use a big red X icon to mark off the nodes and branches that have already been discussed. I hear people complain about Freeplane not being pretty or visual enough. To me that is an advantage. I find pretty colour schemes distracting. All I want is black font and a white background. I do like the automatic colouring-in of the lines representing the branches, as that guides the eye and helps comprehension. But otherwise I want to be the one who decides when to apply additional colour or an icon to introduce new visual information. And I only do that to highlight important nodes, so I can quickly pick them out from a complex mind map. I thank the developers for keeping the main interface simple. By the way, don’t be confused by the screenshots on the Freeplane website. Obviously, the developers are trying to show off all the different features. However, pretty much all the colour noise can be switched off, and you can use it as a minimalist, almost black-and-white (or whatever colour-combination you like) note-taker and organiser. I was glad to see that the latest version (3.6.3b) of Noteliner now supports “unlimited colors for lists, note highlighting and sections of text.” For me colour has always been an important factor in outlining. There seem to be two main approaches. Noteliner exemplifies the approach whereby you are given complete manual control over changing the colour of the foreground (the font) or the background (highlighting text). This approach comes in handy when you want to mark up an existing outline in different colours to emphasise particular meanings or functions. The downside is that it is a manual process, so in the case of a long outline it would be rather fiddly to be changing every item to a different colour. This is where the alternative approach excels: outliners that provide an automatic colouring-in option using some kind of a template. Natara Bonsai 5 (Desktop Edition) — my favourite single/dual/triple etc.-pane outliner — does this very well. 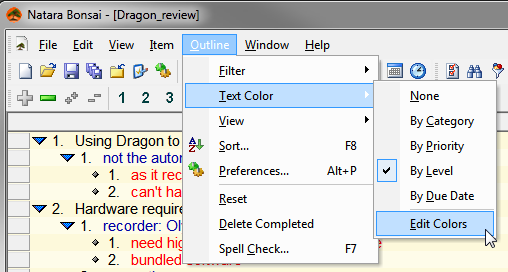 If you choose Outline > Text Color from the main menu, you are presented with four options. You can colour in your outline automatically according to each outline item’s category, priority or due date, assuming that you have added these values to the outline items. 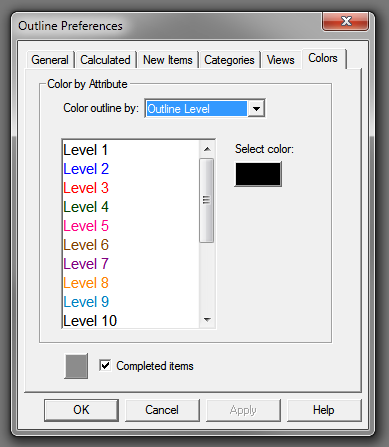 My favourite feature is the fourth option, “By Level,” which means that each outline item will be coloured in according to its place within the hierarchy (available up to 16 levels). You can even select a custom colour for the completed items, in case you opt to have a check box in the outline. Below is an example of such a coloured-in outline. I like this feature because it makes it so much easier to analyse a long, complex outline and comprehend the relationships between concepts at different levels of the hierarchy. Also, under View > New Outline Defaults you can set up a colour scheme for any new outline, whether created from scratch or imported or pasted in from elsewhere. The colouring-in options are saved thereafter for each new outline. The downside of this approach is that (at least in Bonsai) there isn’t a way to do ad hoc highlighting or colouring-in of font (as there is in Noteliner). It would be nice if one could still mark up an automatically coloured-in outline with additional highlighting. Other outliners I’m aware of that can do some colouring-in are StoryView/Outline 4D, Inspiration, BrainStorm, and UV Outliner. There is also Redhaven Outline, which has an interesting implementation of colours (see their Youtube video on that). Adding a reverse outline (headings and subheadings) to the draft [5 and 6 are a more or less simultaneous, recursive process] . Adding a reverse outline (headings and subheadings) to the draft. The above chart could have been more representative by having an arrow between ConnectedText in Step 4 and Freeplane in Step 5, as the CT project outline would be exported as a .mm file and imported into Freeplane. This is an important relationship as the links to the selected CT topics will be preserved and remain clickable, thus turning CT+Freeplane into a virtual dual-pane outliner/notes organiser. Also, Steps 5 and 6 should have been alongside each other or at least there should have been arrows pointing back from 6 to 5, as the reverse outlining process is part of the drafting process. After writing 3 or 4 paragraphs I immediately add headings and sub-headings and slot them into Outline 4D’s single-pane hierarchical outline. Upon further reflection this is still not an entirely accurate picture of the entire process and set-up. An additional element emerges in Stages 5 and 6: the management of writing fragments that have to be removed from the draft in Outline 4D during interim editing and need to be kept apart. I may reuse some of these later, if and when the need arises. Initially I just used a text document in NoteTab for this. But as the number of fragments grew, I needed a more sophisticated solution with the ability to split text into paragraphs and rearrange them in a hierarchical outline. For now I’ve been using Scrivener for Windows for this, which works well as a two-pane organiser of notes and also has the handy “split selection with title” command for breaking up a text into segments. However, I find Scrivener a bit of an overkill (and too slow on my Windows 7 system) for this. I’d prefer to use a lightweight, small footprint two-pane outliner that allows for the easy rearrangement of fragments. My favourites on "Alternative To"